This recipe, I got it from Priya’s blog – Priya’s Versatile Recipes. In blogger world, I think, there is no need to introduce priya as, everyone of us know her blog and her fabulous recipes. She is an awesome blogger with thousands of recipes… (Unbelievable…. isn’t ). When I saw her post of this recipe, that evening itself I tried and it came out very well and everyone in our family loved it. Its very simple yet very yummy… The only difference is I didn’t add honey, as I felt, the banana itself too sweet. Add all the above said ingredients and make into a thick batter consistency. Heat oil in a pan and drop a spoonful of batter to the hot oil and fry till it becomes dark brown in colour. I did as you said but the inside was raw. Delicious tea time snack! !Its been a long time since I've made this. Can't wait to try! Akila … You have been nominated for my NEW Food Stories Award for Excellence in Storytelling. Check out my site for the details (foodstoriesblog dot com). Very new to me and looks so tempting..thanks for visiting my space and ur lovely comments..glad to follow u too.. 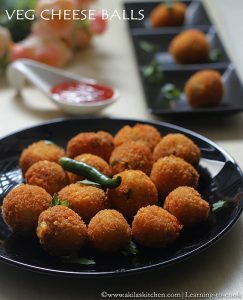 Delicious, shud try this out..
Am very addictive to this bonda..looks very tasty!! Thanks for trying Akila, they came out super crispy and addictive. Reminded me of the Banana Bondas my granny made…Great snack recipe, have to try them. Oh I thought it was raw banana namkeen bondas. love the rich brown color. Awesome bondas to see first thing this morning !